1) For nominal loads below 500 N the accuracy class is ± 1,6 % of F.S. 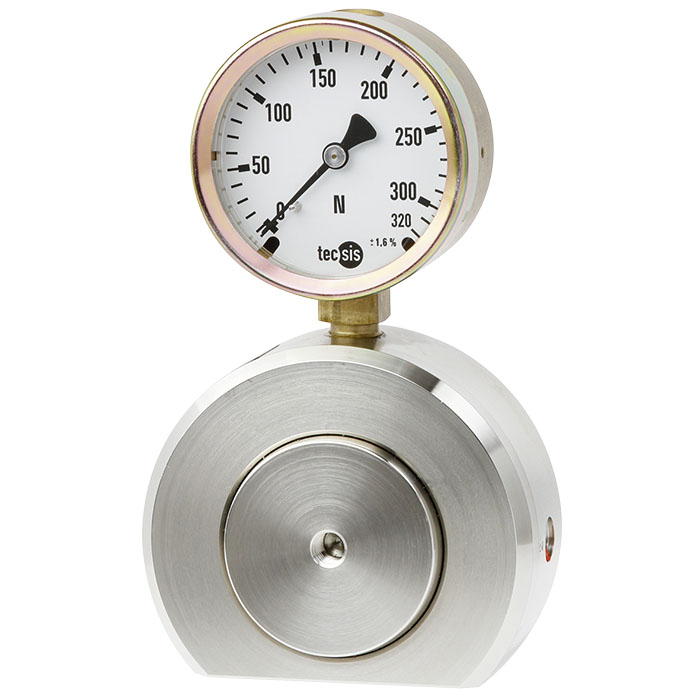 for all pressure gauges. 2) Precondition for the prolonged guarantee to five years is that the hydraulic force transducer is only used within the intended using conditions. 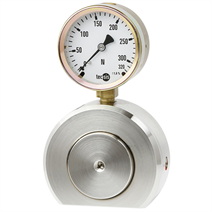 Hydraulic force measurement is an easy way to measure and display force in various applications. The flattened housing of this compression load cell enables a stable measuring in parallel clamps. The force measurement utilizes the hydraulic principle: The force applied to a piston generates a hydraulic pressure, which is displayed with an indicating device. The scale of the indicating device can show various units e. g. N, kN, kg, t.
The leak-proofness guarantee is prolonged to five years 2). In the unlikely event of a leakage the transducers will be repaired free of charge.